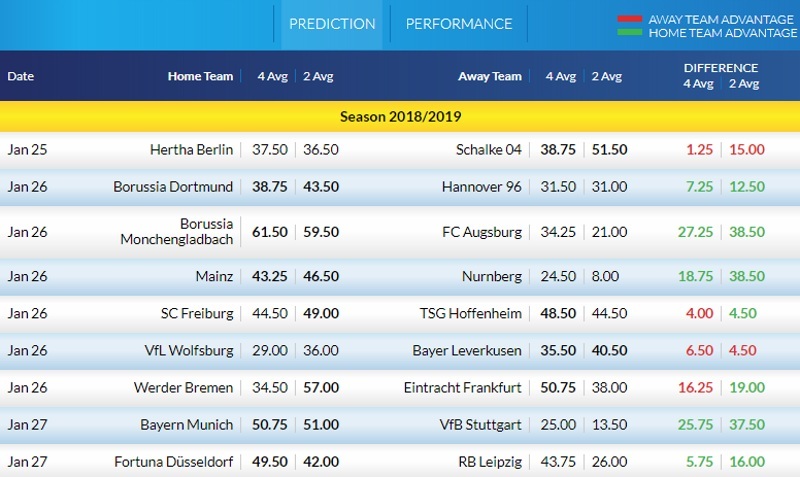 The Bundesliga I and II odds and ratings are out. We have matches scheduled all over the place. Bundesliga I will take place this weekend but the Bundesliga II games are scheduled for the middle of the week next week due to cup games taking priority this weekend. Take a look at the information above then let us know your bets below! 73% of Schalke 04's goals have been scored in the second half in Bundesliga. Dortmund have scored in each of their last 16 matches in Bundesliga. 38% of Frankfurt's conceded goals occurred after the 75th minute in Bundesliga. Hannover 96 have failed to win in their last 7 matches in Bundesliga. Hoffenheim have failed to win in their last 7 matches in Bundesliga. 67% of Wolfsburg's matches had over 2.5 goals scored in Bundesliga. Werder Bremen have scored in each of their last 18 matches in Bundesliga. Not so much Time today, but i think we can made some Profit today because Fixtures and first Matchweek after Winter-Break are good for todays bet. For me today i like Hoffenheim to Win. I´ve wrote it in last Weeks Preview against Munich. Hoffenheim in full of Fitness after Winter Break and made a good Game against Munich. Freiburg on other Side only 1 Lose at Home against Hoffenheim in all Time but for me today and what i see on first Game after Break - Hoffenheim can win this. Then for me i play Away Win on Leverkusen but only on DNB. Leverkusen lost First Game at Home againts Gladbach, but they shouldn´t lose such a Game. Leverkusen with many Chances and today agaisnt Wolfsburg who for me are a not the Same Quality like Gladbach. Think now after Winter Break Wolfsburg will slip slowly down in Table. Also i see Dortmund will smash Hannover today - simple Reason here is - that Hannover´s Squad isn´t good Enough. Should become 4-5 Goals from Bremen last Week, but they didn´t score only once. So i think Dortmund with his quality can made this heavy today. The game that stands out for me this weekend is the David vs Goliath encounter being played at the Merkur-Spiel Arena in a 5pm kick-off this Sunday between lower mid-table Fortuna Dusseldorf and European qualification hunting RB Leipzig. I think there could be a surprise result on the cards here. Fortuna Dusseldorf were looking dead and buried before Christmas. The club had lost 8 of their 10 league games heading into mid-December and relegation was looking likely. However, an incredible run since 15th December, 2018 of four straight league wins has seen Friedhelm Funkel's side storm up the table. They are now sat in 14th place and closer on points to the European spots than the automatic relegation places. RB Leipzig might be one of the world's most unpopular teams but they continue to impress on the domestic front. Ralf Rangnick's team are in 4th place and just inside the Champions League qualification spots. The only issue is that they've lost 2 of their last 3 league games. OK, so those were two 1-0 defeats to Bayern Munich and Borussia Dortmund but losing can easily become a habit. They'll be hoping to draw strength from the dramatic 3-2 win over Werder Bremen that was sandwiched by the two losses. I'm going to use this game as a chance to take a bit of a risk. I managed Fortuna Dusseldorf on an old Football Manager game. I guided them from the 3. Liga to European competition so I feel I should back them here. I'm not sure what the players ate over Christmas but whatever it was has worked wonders. Can they take something in this biggest challenge yet? RB Leipzig have only won 2 games on the road this season. It could well happen! @Magic0024, @malabgd, @sajtion, @betcatalog, @DrO, @Neubs, @Xcout, @Banter1, @Bayern, @DonPaulo, @fhuefdsa, @Franger83, @Uriel18, @VYA, @EuroDream, @JPee, and @JKos, what do you guys think of this tip? Any bets you're thinking about for these games? Borrusia Gladbach are super strong at home. 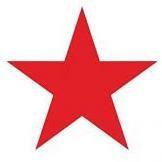 They are a very good team with tons of attacking options and have won 11 in a row at home. See no reason not to back them here at -125 vs Augsburg. 32% of Stuttgart's conceded goals occurred after the 75th minute in Bundesliga. Düsseldorf have won their last 4 matches in Bundesliga. RB Leipzig have scored 77% of their goals at home in Bundesliga. Braunschweig - Rostock here i take the Both2Score. Braunschweig relegated Team and now also sitting on Last Place. The Team isn´t so bad and now after Winter Break there are no Questions here - they must win. Rostock on other Side changed Coach and they have some really good Offensive Players in there Suqad. IF they want to reach there own Target - which is Place 3 they must also come as good as possible out of the WinterBreak. Other 3rd League Game today i prefer Uerdingen to win. Rich Investor behind the Club and with some great quality Players for this League they should to this now in 2nd Half of the Season. 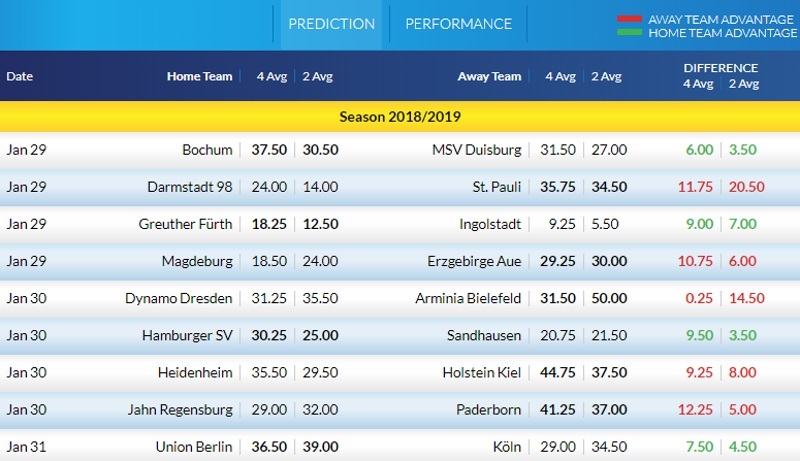 Wuerzburg is medicore Team of the League and if they want to Promote this Season Uerdingen must win this. And then i take Leipzig to win against Duesseldorf. Must say, Duesseldorf won at Home against Hoffenheim and Dortmund but in both Games there was many Chances for the Away Teams. Didn´t think that they can hold this Form and have such a good luck here in every Home Game. 67% of FC Köln's matches had over 2.5 goals scored in Bundesliga II.